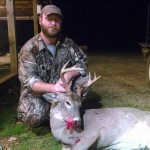 Will Coleman with one of several bucks he took during the 2013-2014 season. 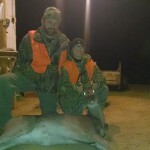 Mikey “Twig” Bedford with his very first deer! 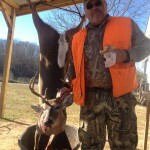 Rickey Gregory with this nice young buck taken on the property. 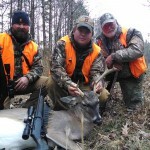 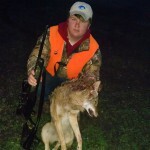 Max Bullock is our youngest hunter in DCHA. 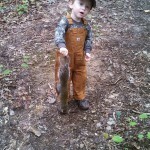 Posing here with a squirrel his dad, Jalon, took during October. 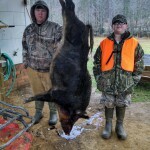 Seen here are Konner Bullock and Twig Bedford posing with a huge boar taken by Denny Ray Richardson. 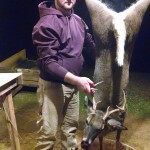 Justin Watson with one of his bucks taken this year. 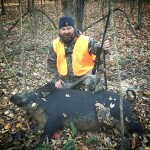 Stretching the legs of my varmint rifle in mid-October. 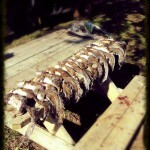 Just one of the successful squirrel hunt mornings around the Bullock Camp. 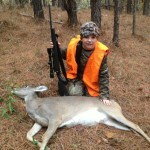 Winner of the 2013 Youth Day Contest, Braden Cobb with his 90lb doe! 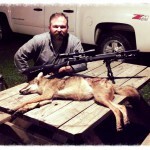 Coyote encounters were up this year, but so were the kill rates!